Once upon a time a dog traveled the globe in search of the perfect home. He visited many countries, learned interesting facts, and made new friends. And he did find that perfect home ...at 1600 Pennsylvania Avenue, to be precise. A very special address with a very special family. And now at Christmastime, Dog learns that his new home hosts a very special holiday party. With a lot of important visitors on the guest list, it's going to take a lot of preparation to get this "house" ready for the holidays. It's all paws on deck to make sure everything is in order, from the sparkling tree in the Blue Room to the delicious gingerbread house in the State Dining Room. But Dog is curious about how the rest of the world celebrates and he asks his international guests to share their favorite holiday traditions. 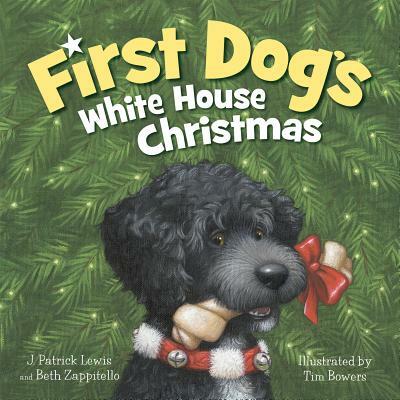 And when the festivities start there's no stopping these tail-wagging partygoers J. Patrick (Pat) Lewis lives in Westerville, Ohio, and is the author of 60 books for children. He visits elementary schools and speaks at literature conferences. This is his second book with his daughter, Beth Zappitello. Beth has a marketing company and lives in Portland, Oregon. Tim Bowers has illustrated more than 25 children's books, garnering such awards as the Chicago Public Library's "Best of the Best" list. Tim lives in Granville, Ohio.